Cindy Hill has owned The Decorator Exchange in Wellington for more than 15 years. It’s a treasure trove for anyone wanting to redecorate. Cindy Hill has been running The Decorator Exchange at 88 Upland Road, Kelburn, in Wellington, since 2001. It’s a goldmine for anyone seeking to redecorate their house with quality recycled soft furnishings, all sold on behalf of private sellers, many of whom Cindy has known for years. 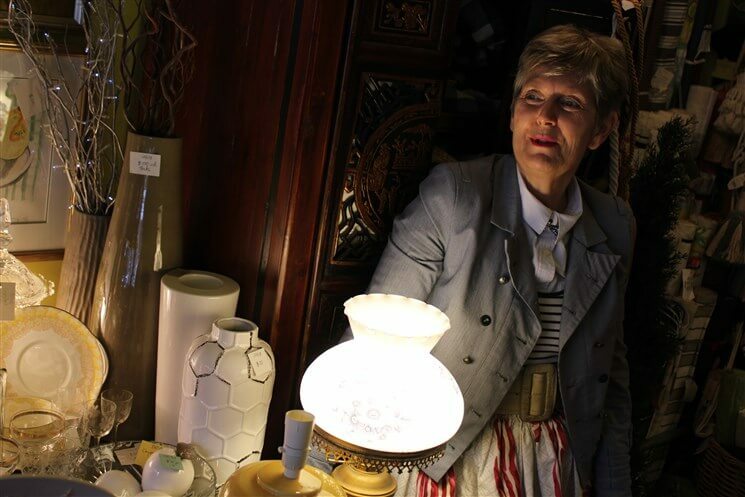 Alex Staines chatted with Cindy about her passion for the business of selling second hand curtains, blinds, lamps, and all manner of things interior and stylish. Cindy’s interest in recycled soft furnishings began when she was in the UK in the late ’70s and early ’80s. Curtains are considered to be a fitting rather than a fixture, so when a house changes hands, the vendors take the curtains, and look for a way to on-sell them. There was a demand for trade in secondhand curtains, but in those days there wasn’t an eBay or a TradeMe, so a few smart people set up businesses as an outlet for them, mostly in the outer suburbs of London. They did quite well, and some of the original shops are still doing well. “In those days I didn’t have my fascination with curtains. I loved fabrics and things, thanks to my mother’s interest in it all,” Cindy says. “My mother just loved floral fabrics. She loved gardening; she adored roses. “She was on an isolated high-country farm in behind Kaikoura with not a lot of colour around, but she did her very best. “Before she married my father – this was straight after the war and fabrics were very hard to come by – the first you could get were household fabrics such as curtaining and upholstery. Everybody was making clothes out of them. “So my mother had these gorgeous ‘curtain clothes’, as we used to call them in the dressing-up box.” It must be in her genes (not jeans), as Cindy is wearing a skirt of beautiful curtain material. After her UK sojourn, Cindy moved to Australia for six years. Second hand curtain shops were beginning to pop up in Sydney just as she was about to return to New Zealand. She thought, “Maybe I’ll do my own business and I could do something like that,” But she really didn’t get very far with the idea at that stage, as she had been head-hunted back into working in personnel. Then one day, Wendy said she was going to sell, so Cindy bought the business. What was fantastic was that Wendy had already done most of the legwork – she’d built up a really good reputation. Curtains were a feature of the shop – they were its main business. When Cindy took over, there were a lot more curtains. “I hounded the local designers to bring me their ‘mistakes’,” she says. “Now I get curtains sent from all over New Zealand, from designers and individuals. “Mostly it’s reputation – they’ve heard about me somehow. Plus secondhand curtain shops aren’t that common in New Zealand,” Cindy says. Not long after Cindy took over the shop, a friend of hers said “oh good, I’ve got curtains, so I want you to sell them for me”. Cindy said “great”, knowing that she had really good taste. In she came with some absolutely stunning curtains. A set of four, made by Peter Reynolds up in Rotorua, who’s one of the best curtain makers in New Zealand. The colours were gorgeous and the fabric exquisite. The curtains were goblet-pleated, bumphed (interlined), back-lined; they had tassling, fringes down the sides – the whole nine yards. She’d paid $16,000 for them. The best part of it was the front part of the fabric was so politically incorrect – it was called “the plantation owner”. It had the plantation owner sitting there with a parrot on his shoulder, being fanned by a little boy. His wife was there, having her tea poured … you get the picture. So – price wise – Cindy decided to sell the curtains for half what her friend had paid for them. They sat in the shop for a year, and became the talk of the town. “That woman who’s taken over The Decorator Exchange expects us to pay $8000 for those” – that kind of thing. One of Cindy’s very regular customers was the CEO of the New Zealand Portrait Gallery. She came racing in one day in an absolute panic because she needed something “preferably blue but definitely silk”. “I can’t tell you, but it’s really, really important,” was the reply. She bought the curtains and off she went. A couple of days later, there the blue silk curtains were, on the front page of The Dominion, with the Duke and Duchess of Cambridge, during the unveiling of a new portrait of the Queen by Wellington artist Nick Cuthell. 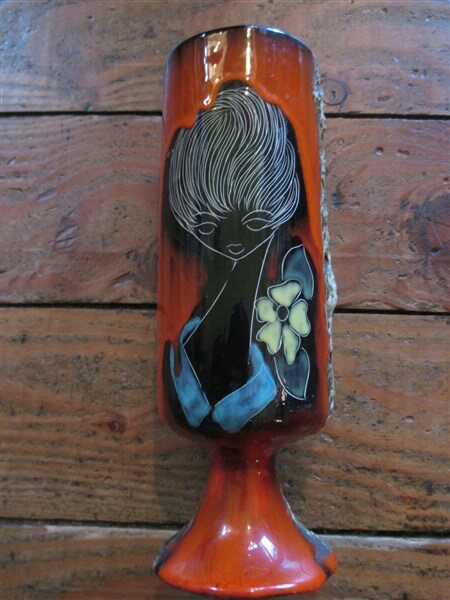 The Vallauris vase sold by Cindy. This pottery vase came in the door and the owner knew it was French and that was about it. Cindy did a bit of investigation and found it came from Vallauris, a commune in the alps of Provence, which had been a pottery centre since Roman times. The commune enjoyed a renaissance after WWII, when artists such as ceramicists Charles Voltz and Roger Capron, and luminaries like Marc Chagall and Picasso, worked there. All the major French artists and potters were there at some time. The artists at Vallauris only signed their pots with the name of the commune, so the vase Cindy had could have been made by anyone. It could have been a Picasso! “It sold very quickly, even with a bit of damage,” says Cindy. The Decorator Exchange – the ultimate in recycled soft furnishings. Visit Cindy at 88 Upland Road, Kelburn, Wellington. The shop is open 9am–5pm weekdays, and 10.30am–2.30pm on Saturday. Follow The Decorator Exchange on Facebook, Pinterest, Instagram and Neighbourly. Email thedecoratorexchange@clear.net.nz or give Cindy a call on 04 939 6980.